ORLANDO, Florida – SeaWorld Orlando’s critical care facility is taking care of three manatees rescued in Brevard County and Volusia County, Florida. The Florida Fish and Wildlife Conservation Commission (FWC) rescued a manatee mother and her young calf from the Tomoka River on May 9 near Ormond Beach, Florida. After careful monitoring by the FWC, rescuers determined that the 10-foot-2-inch-long, 1,255-pound manatee mother was experiencing severe buoyancy issues, which could negatively impact her health, eating patterns and the nursing of her calf. Due to the impact scar on the adult manatee’s back, rescuers believe that she was struck by a watercraft. 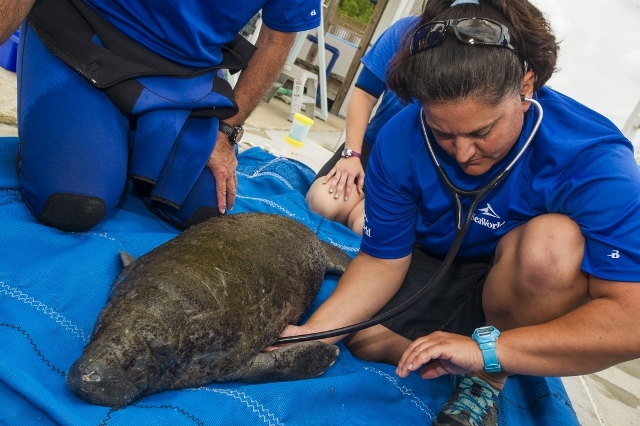 This caused her to suffer from a pneumothorax (air trapped inside body cavity), so SeaWorld’s expert veterinary team placed the manatee in a wetsuit to stabilize the manatee’s buoyancy issue and was successful in removing the air trapped in the chest cavity. SeaWorld said in a release that the manatee is no longer in the wetsuit and has been seen swimming more upright. Although showing signs of progress, the care team still remains guarded and has performed radiographs on the mother to ensure there are no broken bones or any other internal damage caused by the watercraft. The mother’s young calf came in weighing approximately 97 pounds, measuring 4 feet and 5 inches, and still nursing from its mother. The calf has not left its mother’s side and has continued to nurse consistently throughout the rehabilitation process. The calf has also begun to take an interest in eating solid foods, which SeaWorld said is a sign of good health. FWC also rescued an orphaned manatee calf near Satellite Beach, Florida and transported it to SeaWorld Orlando. The calf received immediate nutritional support and is currently under a 24-hour watch by the SeaWorld Animal Care team. The SeaWorld said that its Animal Care Team will continue to work around the clock to provide these three manatees the highest quality of care with the ultimate goal of returning them back to their natural environment. So far in 2016, SeaWorld Orlando has rescued 11 manatees, and returned 13 back to the wild.